MercadoLibre is an online marketplace dedicated to e-commerce and online auctions. It is Latin America's most popular e-commerce site by number of visitors. 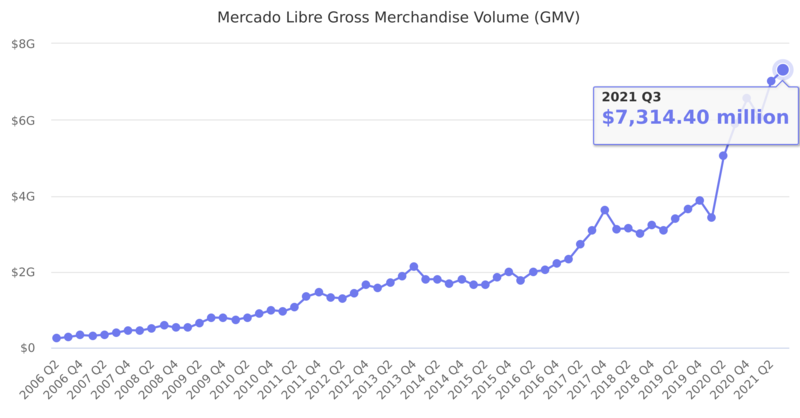 Gross Merchandise Volume (GMV) is affected by currency exchange, number of items sold is a better metric to understand growth. 56% of sales are made in Brazil, 30% in Argentina, 5% in Mexico, 3% in Venezuela and 4% in other countries. Last reported quarter 2018 Q3 it was $2,995.20 million, down by -3% year-over-year from $3,075.30 million. From $8,048.10 million in 2016 it increased by 46% to $11,749.70 million in 2017.